“Focusing on driving loyalty with existing customers is the best way to grow, right?” asked the CMO of a major retail client this week. “Analysis shows that if we get loyal customers to spend just 10% more, we’ll create $500million of extra revenue!” the CMO explained in support of the loyalty-focused strategy. The key word here is, of course, “IF”. This sort of analysis is what Byron Sharp calls ‘a thought experiment’: a theoretical exercise that is unlikely to work in practice, based on empirical evidence collected by him and the team at the Ehrenburg Institute over many years. Below I look at how Byron busts the brand loyalty myth in his How Brands Grow-Part 2 book (1). Its common to hear the leaders of small brands say that they plan to grow by driving loyalty. “We don’t have many buyers. But boy, they love us and buy us loads!,” they enthuse. This is in fact a dead-end. The biggest difference between small brands and big ones is not loyalty but rather penetration: the number of people buying the brand at least once in a given period. 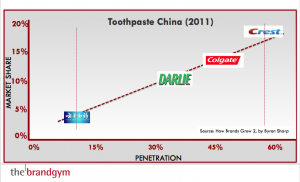 Penetration is the key reason Crest is the biggest toothpaste brand in China, for example (see below). Crest’s penetration is 6 times that of the smallest brand YNBY (the blue logo on the far left). To grow, YNBY needs to drive penetration. What about loyalty? Well, here’s the bummer for small brands banking on a band of loyal customers. Bigger brands have much higher penetration AND slightly higher loyalty levels; the law of ‘double jeopardy’. Crest does have higher loyalty than YNBY (x1.3), but this is much smaller than the difference in penetration (x6). 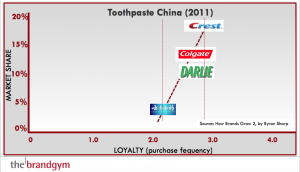 To match Colgate’s share via a loyalty strategy, YNBY would have to grow frequency from 2.2 times to 14 times, clearly impossible. The only way to drive loyalty is … to increase penetration! Why do small brands have lower loyalty than big brands? Small brands are less well known and stocked in fewer places. As a result, the people that do know them tend to be heavy category buyers who are already purchasing plenty of other brands. A variation on the loyal buyer myth is the idea of trying to create sole buyers: people so crazy about your brand that they buy you and no-one else. 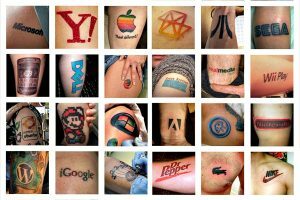 People with ‘loyalty beyond reason,’ to coin the phrase from the Lovemarks philosophy, who might tattoo their favourite brand of soft drink on their body. In reality, the only people likely to be sole buyers are infrequent category buyers. 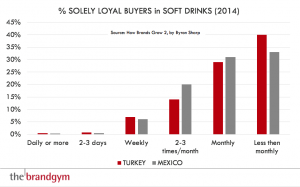 Data on the soft drink category in Turkey and Mexico shows sole loyalty is highest (40%) amongst people buying monthly or less. However, this group make up only 5% of category buyers. Amongst heavy category buyers less then 1% are sole buyers. Existing customers seem attractive from a marketing stand-point. A common strategy is to invest in attempting to get them to buy more. This is especially popular with service brands like banks, who spend heavily on trying to drive ‘cross-sell’, such as selling investments to customers who only have a current account. 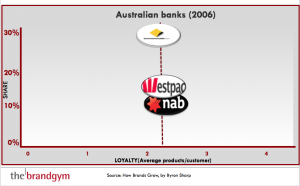 However, levels of cross-sell tend to be similar for brands in a given category, as shown by the data for Australian banks below. You already reach heavy buyers with your marketing. They’re much more likely to notice your advertising and any service improvements; they are ‘tuned in’ to your brand. Another reason used to justify investing marketing on loyal customers is that they generate valuable word-of-mouth. This is another myth that needs busting. In reality, most word-of-mouth doesn’t comes from heavy brand buyers. First, heavy buyers are small in number. In addition, they are already familiar with the brand, and so the brand is less ‘newsworthy’. Heavy shoppers of the Matahari chain of department stores are 11% of all buyers and account for only 15% of word-of-mouth, for example. Less frequent shoppers create 5 five times more word-of-mouth, as there are much more of them and the brand experience is new. So, again, the way to create word-of-mouth is not by focusing on loyalty, but rather to drive, you guessed it, penetration! In conclusion, the next time you hear someone suggest the way to grow is by increasing loyalty or targeting heavy buyers, you are armed with some hard data, ready to make the case for driving penetration.